It’s officially Spring so get outside and do something fun . . . like blowing bubbles. If you have young children or teach Sunday School or preschool, here are a few quick faith lessons using bubbles you can try. GOD GIVES LIFE. Blow into bubbles to demonstrate how God blew life into us. “Then the LORD God formed the man of dust from the ground and breathed into his nostrils the breath of life, and the man became a living creature” (Genesis 1:7 ESV). What you say and do: Show kids your bottle of bubbles. “Who loves bubbles? I sure do!” Open it up and show dripping liquid. “Oh no! This isn’t a bubble. It says right here that it’s a bottle of bubbles, but this dripping mess isn’t right. Did I get a bad bottle? How do I get a bubble?” The kids will likely tell you that you have to blow to get the bubble. GOD MADE YOU UNIQUE. 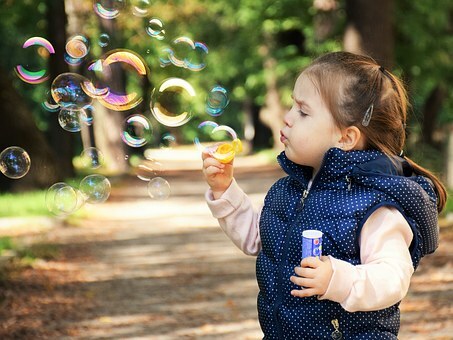 Show how bubbles are different shapes and sizes and remind kids that we are each unique as well with different purposes, according to God’s plan. “But as it is, God arranged the members of the body, each one of them, as he chose. If all were a single member, where would the body be? As it is, there are many parts, yet one body” (1 Corinthians 12:18-20 ESV). IN GOD, YOU ARE STRONG. Show how God makes us strong by using an unusual bubble. “Have I not commanded you? Be strong and courageous. Do not be frightened, and do not be dismayed, for the LORD your God is with you wherever you go” (Joshua 1:9 ESV). Note: This lesson requires a little bit of prep work and a few purchases . . . but it is worth it! I learned it many years ago at a conference and it is one of my favorite lessons. Prep: Empty the regular size bubble bottle (save the liquid for bubble refill) and cut out the bottom. Hot glue the mini bubble bottle inside the top half of the bottle. Check and make sure the clear marble or plastic ball can slide up in the bottom half of the bottle. How to use: Before you pull out your bubble bottle for the kids, make sure you have the clear marble/ball hidden inside the bottom of the bottle. Cover the bottom with your hand to hold it in place as you blow bubbles and chat with the kids. Take off the cap and begin blowing bubbles. Blow quite a few bubbles. Let the marble/ball drop into the hand that is holding it in the bottom of the bottle and keep it hidden. Then reach out as if to pop some of the bubbles with that hand. As you do, reveal the marble/ball as if it is one of the bubbles you plucked out of the air. GOD ALWAYS HEARS YOUR PRAYER. Blow prayers into bubbles and know they are going up to God. This principle is my favorite and something I address in my book, The Bubble Who Would Not POP! It works best if you do this outside so some of the bubbles can disappear into the sky. It’s also fun if you want to give each child a bottle of mini bubbles at the end of the lesson. “Before they call, I will answer; and while they are yet speaking, I will hear” (Isaiah 65:24 ESV).